Timor-Leste has the highest stunting rate in children in the world, at 58%. Stunting affects health, physical and cognitive development capacity in children as well as productivity in adulthood. Consequently improving childhood nutrition is a national priority. 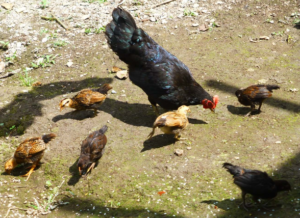 The Crawford Fund provided funding for visits to Dili to support the Ministry of Agriculture and Fisheries’ village poultry improvement program. The program seeks to contribute to improved food security, childhood nutrition and income generation. Associate Professor Robyn Alders AO, from the Faculty of Veterinary Science, University of Sydney reported on the visits. The overall aim of the trips were to gain a better understanding of the people, the culture and the current situation in Timor-Leste, to set the scene for the design and implementation of research into the linkages between village poultry, household food security and human nutrition. We released a video on similar work by Robyn in Africa, which you can view on the Crawford Fund YouTube site. Some interesting and important attitudes were revealed that will guide future activities. For example, there was an unexpected finding that every farmer spoken to would prefer to sell their chickens and eggs, rather than eating them to improve their own family’s nutrition. Within the local context, in low income or food insecure households, the value gained from selling a chicken is perceived to be much higher than the value of eating the chicken. This means that until households are more certain of a regular income, it is likely that this behaviour will continue to be the predominant response to increased chicken numbers. The outcome of these trips included establishing relationships with relevant Ministry of Agriculture and Fisheries staff, commencing study of Tetun language, familiarisation with local culture and field conditions, which lays the foundation for subsequent stages of the project. The ABC’s Radio National Breakfast program, hosted by Fran Kelly, discussed this issue in an episode on Thursday 21 April. 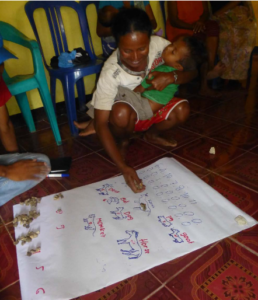 You can listen via this link: Australian-assisted animal vaccination project helps deliver food security in East Timor.